I painted this painting, The Bishop's Valet, several years ago. Little did I know that my brother, the Rev. Charles Erlandson, and I would one day be driving Anglican bishops around to airports, luncheon meetings, etc. I had the first such opportunity, in May 2004. I was to drive (then) Canon Bill Atwood to the AAC's A Place to Stand - Michigan conference. Of course, since that time Atwood has been consecrated bishop! Then, last summer, I was privileged to give Bp. Paul Hewett (Diocese of the Holy Cross) a ride to and from the Detroit Metro airport, so that he could attend the St. Michael's Conference for Youth. Just this past week, my brother had the opportunity to chauffeur and have lunch with Abp. Valentino Mokiwa of Tanzania! I guess that trumps me, an archbishop and all. 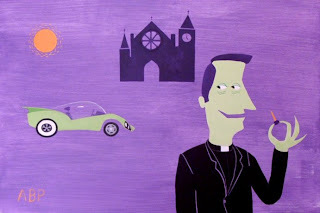 It makes me think that, in my retirement, I would like to build kool kustom kars (like the bubble-top in my painting) for Anglican bishops (only the good ones!!!) to drive around.